About 20 years ago while working at a toy store in Virginia, Marilyn Bloodworth noticed there was a slim range of ethnicity when it came to the variety of dolls for sale on the shelves. Inspired, she took a store-bought vinyl black doll stripped it down and redecorated it from head to toe infusing the doll with a personality of her own. She gave the doll to a neighbor, and next thing she knew, other acquaintances were asking her to make a doll for them. Today, some 2,000 to 3,000 dolls later, Bloodworth has more orders than she can fill as she gives life to dolls representing a dozen or more heritages and themes, from African dolls and Jewish dolls to biblical dolls and cancer-patient dolls. They range from 3-inch finger-puppet dolls to 38-inch high American black beauties. Her creations are called reproduction dolls because they are produced from a mold. They are composed of Li-Que-Che, a papier-mâché liquid. “Basically what I do, if I decide I’m going to make a doll and have the mold, before I do anything I pray. Then I pour the mold and let it drain and sit overnight. The first thing in the morning, I open the mold, and I see this beautiful doll. I let it sit a few hours. I start cleaning it, and let it sit some more. It takes about seven days to air dry like a rock,” she said. “I start forming whatever the doll is. I start putting myself in that doll and am thinking, ‘What do I want to see?’ I develop it in a way that is going to make her come alive. I clean her and start painting her. Currently, about 35 colorful toy people of various ethnic backgrounds populate a table in her office where she makes the dolls and sews their wardrobes. These include a sophisticated mama, an American soldier, the Queen of Sheba, Little Naomi (a cancer patient), the Samaritan woman at the well, Rossie (a pregnant doll who represents Elizabeth from the Bible), Kanika (a doll named for her daughter), Bahama Mama and Southern girl dolls named Daisy Mae and Bobbie Sue. She recently polished off a new creation she calls Foxy Brown. “This is my diva doll. She wears Afro wigs, stands 28 inches tall and is dressed in African apparel and wears a gaily (an African wrap). She’s going to a lady in Pennsylvania,” said Bloodworth, whose dolls have been shipped to many states. Besides the clothes, her dolls wear shoes, sandals or boots, although a few go barefooted, and some bear tattoos such as a butterfly or panther on their arm. “I get a lot of feedback from people and sell a lot through word of mouth,” said the doll maker, whose creations fetch from $3 for a finger puppet up to $300 for one of her masterpieces. 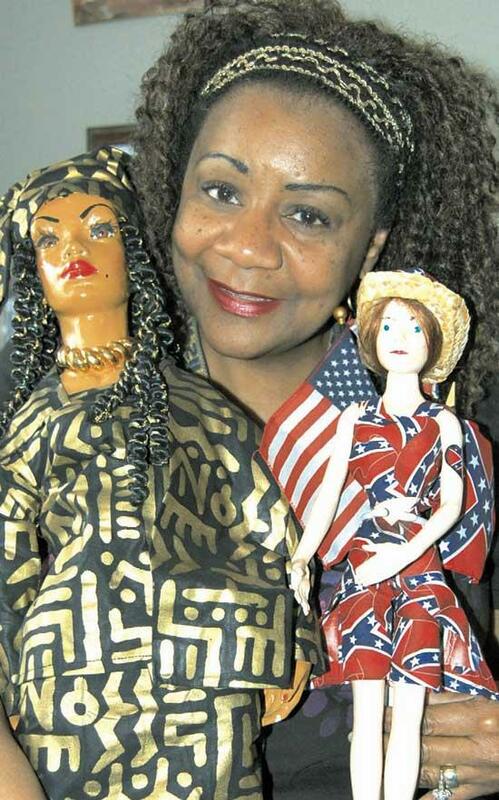 Bloodworth began making dolls in 1990 when she was working at The Children’s Palace, a toy store in Virginia Beach, Va. “I noticed there were not that many black dolls or dolls that represented different ethnic groups. I developed a passion for making Afro-centric dolls,” she said. “One day I took a black vinyl doll, stripped her down, redressed her up and then I gave it to a neighbor. She showed it to other people, and I started getting orders for the doll. She soon began designing her dolls’ wardrobes along with the accessories. Where ever she showed them, she found willing customers, but at the time she was not selling them. Today, she is producing them, one at a time, to sell but can’t keep up with the demand. Bloodworth and her husband relocated to the Woodbury area five years ago because of its friendliness. “We visited with friends here almost every other weekend. We loved the fact that everybody would wave and say hi all the time. This is such a friendly little town. We decided this was the place for us. We love the people here. That’s what drew us,” said the doll maker, who was born in Johnston, S.C., but grew up in New York City. “I was raised on the East Side, 152nd Street, in Harlem. I saw my mom get killed at 6. My brother and I bounced around through the system and wound up going to an orphanage. Later on I winded up living in the Bronx with a wicked stepmother and then we moved to Brooklyn. “I went to Washington Temple Church of God in Christ in Brooklyn and was blessed to grow up with Rev. Al Sharpton, who was my youth pastor. I think he helped shape my life into who I am today. He always taught me to find a cause and fight for the underdog, and that is something I still do today,” said Bloodworth, who has run for Cannon County commissioner. Bloodworth met her husband, Brian, who served 20 years in the Navy, in Virginia Beach, Va., and they have been married for 30 years. They have a daughter and three grandchildren. She worked in the corporate world for five years as an accounting freight analyst in Connecticut. After moving to Nashville in 1993, she was a call center supervisor for AAA Auto Club South. Also an ordained minister, she has a Love-Fellowship Ministry. Several years ago, Bloodworth, a member of the Fraternal Order of Police, began taking classes in law enforcement and criminal justice at Middle Tennessee State University. Then she took a job at Cannon County High School in the Lions Academy. “They saw I was really good with the kids, and so they offered me a position as in-school suspension teacher. I turned it around into the empowerment zone. What I do there, I try to empower the kids to dream big and believe in themselves and try to inspire them. I let them know the importance of their education. What was birthed out of it is very positive,” she said. “I’m completing my bachelor degree in sociology now with Ashford University. So in a way, the doll maker sees herself working with living dolls, the teenagers in her classroom. She not only teaches from real-life experience, she has written about it in a couple of books that include “I’ve Been Redeemed,” about a girl who escaped the ghetto, and “The Ghosts of My Past: Understanding the Journey,” her personal story of recalling stories told to her long ago by her grandmother. “I try to live my life in such a way that the kids see genuineness and realness. I teach real life because I lived it. I know what it like to be abused and to go through life and nobody cares. I’m an open door for these kids. I try to give them real life,” Bloodworth said. “They need to know what’s going on in the real word. I tell them, ‘If I can do this, anybody can do this.’ I came from an area where there was no hope, nobody cared. But I say to them, ‘Don’t let anybody take away your dream that you can make it.’ I teach those kids to believe in themselves,” said Woodbury’s doll maker, whose hands are helping mold Cannon County teenagers in a positive way.